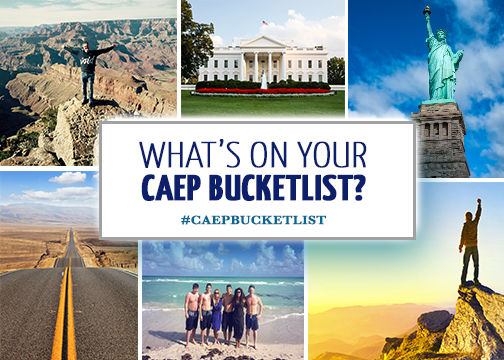 What’s on Your CAEP Bucket list? First off, Happy New Year from your CAEP family! We hope you had a happy and exciting holiday! Now is the time of year where you may be reflecting on the last and planning for a new, but where do you really see 2015 taking you? Will your dreams lead you on a new adventure? Will you achieve a lifelong goal and start striving for the next? What do you want to accomplish during your CAEP experience? But first- What is a “Bucket List”? A “BUCKET LIST” is a list of things that one has never done before and wishes to accomplish in their lifetime. CAEP would like to know what goals, activities, or destinations you have on your “Travel Bucket List” that you hope to accomplish during your exchange experience! 2. Share a photo or video of your bucket list goal, tag CAEP on Facebook, Instagram, and Twitter and use the hashtag #caepbucketlist. 3. Blog about your bucket list goal on the CAEP community (don’t forget to share photos and videos)! Drawings for the CAEP Adventure Bowl will take place in both June and December. CAEP will take the winner and one friend on a mini adventure in your area. Get started on your own bucket list and share your life goals with friends and fellow CAEP participants. To view more ideas and a list of American attractions, login to the CAEP Community or visit our Pinterest board! Click here to download your very own CAEP Bucketlist and get started today! !